It’s been several years since we embarked on our first major road trip with our son. Indeed, he was eight at the time, and we got all kinds of questions and statements thrown our way. “Why bother? He won’t remember anything. Wouldn’t flying be easier? Wouldn’t a trip to Disney be more entertaining?” were a few of my favorites. I admit it made me doubt my motivations for a bit, but we decided to press on with planning nonetheless. We made it our priority and as a result have taken TWO cross-country road trips before he reached the age of ten. One of the major factors in planning was recognizing and staying engaged with his interests. Not only was he becoming accustomed to playing and experiencing the outdoors, he started discovering the wonderful world of dinosaurs. I mean who didn’t like dinosaurs at this age? His curiosity had continued to grow for several years. He would watch BBC documentaries on the subject with a little help and really got into the PBS show Dinosaur Train. The presenter and paleontologist, Dr. Scott Sampson ends each episode with the tagline, “Remember, get outside, get into nature and make your own discoveries!” Now this was something we could get behind! What better way to “make his own discoveries” than to introduce him to some of the best this country has to offer. Based on his insatiable dinosaur interests and comfort level with the outdoors in general, we decided on Badlands National Park as our first major destination. I had visited the Badlands during high school and had a sneaking suspicion he would fall in love with the place. We started planning, did a little research, made a few reservations and before we knew it, hit the road with a packed car. We quickly discovered – much to our delight – finding stops along the way were crucial to our enjoyment and experience. These were both planned and spontaneous. 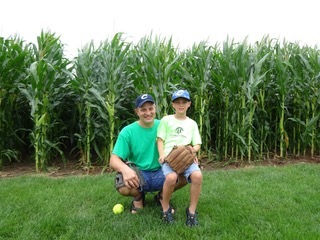 Our first planned stop – The Field of Dreams in Dyersville, Iowa. Yeah, I’m a sucker for this movie and it was along our route – kind of – so why not make the detour? We ran the bases, played catch and enjoyed our time in the middle of a corn field. It was a special couple of hours and continues to be gratifying in the fact my son continues to mention the experience to this day. Our first spontaneous stop – The Lowell and Agnes Walter Estate at Cedar Rock in Iowa. What? Our first clue was the sign “Frank Lloyd Wright House” along the side of the US-20. Instantly my wife and I were intrigued. What we found was a great story and hidden gem. The house had been left to “the people of Iowa” and was managed by the Iowa DNR. We were able to take a guided tour of the house, the grounds and experience first-hand a vision of the architect. Again, as parents, we were excited by the spontaneous adventure and thus our son was as well. Does he still mention it? He sure does! During both trips, we learned how to diffuse some of the normal annoyances as well. “Are we there yet?” or “How long until we get there?” are two cringe-worthy phrases for any parent. Making frequent stops helped reduce these questions. Sure, getting from point A to point B took a little longer than what you would expect, but the expectations changed. We didn’t rush…. we stopped to smell the roses so to speak and discovered a great deal along the way. 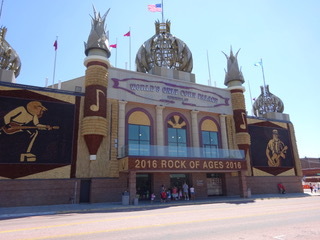 As big as the country is, you can always find a quirky piece of Americana, such as the Corn Palace or Wall Drug during your travels. The bottom line for us is that we weren’t intimidated by the unknown of a long trip. We weren’t concerned about our son remembering every little detail of our adventures. (Spoiler – I don’t remember every detail either). We WERE concerned with showing him a love of travel, exploration and the excitement it fosters. These trips ended up being some of our proudest accomplishments as parents! In the end we all survived the trips and made our primary destinations of Badlands National Park, Glacier National Park, Rocky Mountain National Park among many. I’ll delve into the details and share our experiences in future posts. Don’t be intimidated…hit the road and make your own adventures! Do you remember your first road trip or one that you took your kids on? Relive the memories with a comment of your favorite part! Thanks for reading and make sure you sign up in the email to stay connected in our community.